Even shorter nails to attach the top bars. Very small nails or pins work best, so you can remove the top bars easily during harvest time. Top bars are an integral part of the Warre Hive Box. Each hive box needs its own set of top bars. You will need to cut rebates into two sides of the hive box to support the top bars. 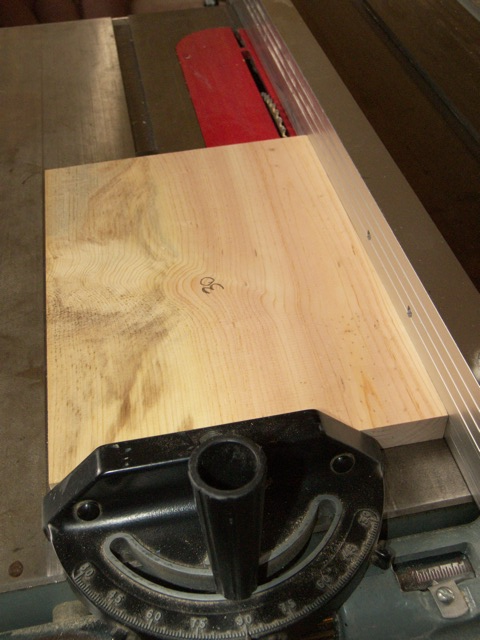 You can cut the rebates with a router, or you can use a table saw. Following are the instructions for a table saw. Set up your saw so that the fence is 1cm away from the blade. Set the blade to a depth of 1cm. Take one of the short sides measuring 30cm long by 21cm wide (11 13/16″ long by 8 1/4″ wide) and run it through the saw lengthwise. Please note that I have removed the table saw protective guard for demonstration purposes. Please do not use your table saw without proper safety precautions. 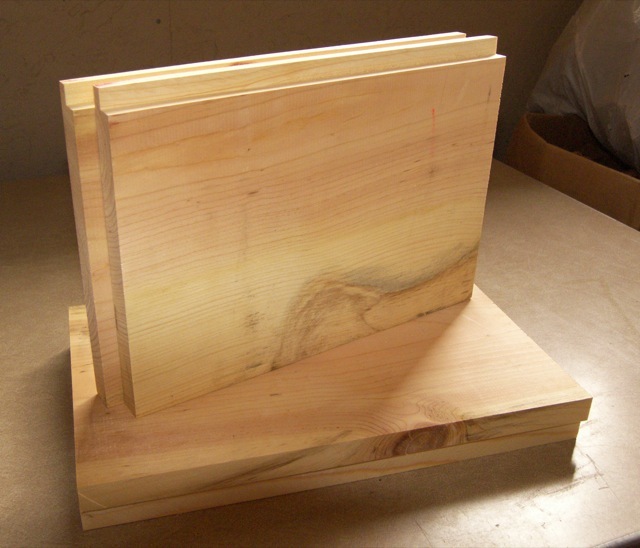 Refer to the information provided by your table saw manufacturer. Thanks! You should now have a board with a slot cut into it, as shown in the picture below. Now take the board and stand it upright. 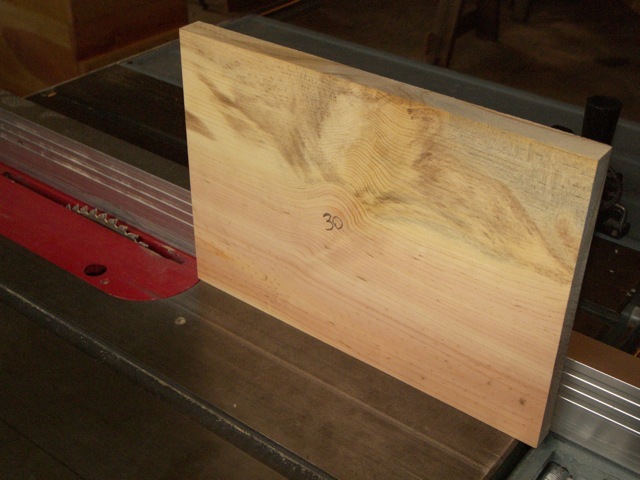 Place the previous cut towards the fence and run the board through the table saw. You should now have a nice rebate cut into the long side of the board. 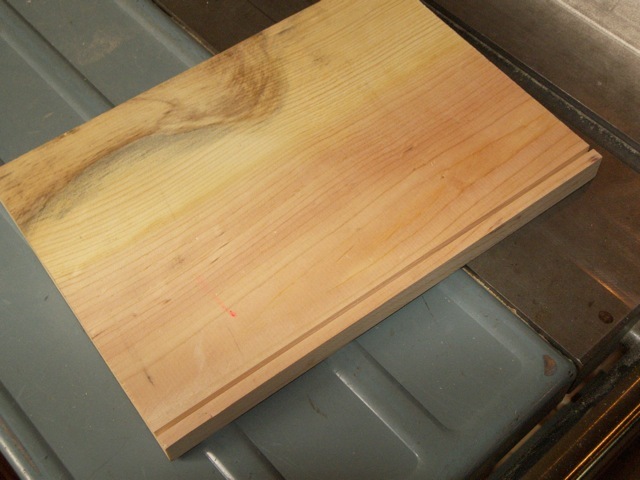 Repeat this process for the other short board measuring 30cm long by 21cm wide (11 13/16″ long by 8 1/4″ wide). Congratulations on preparing all the hive box parts! Go on to the next page where we will build the hive box. Yassin – Glad that you found it helpful! Thanks for your effort here, what a great site. Just looking at the top bars and that you have them fastened. Why is that? It seems like this is the first time i’ve seen it. john – Thanks for your compliment! I attach my top bars with small pins just to keep them in place. The pins are very small, so it is easy to remove the top bars. You could just lay the bars in the hive box if you want…it would work just as well! aco – It is about 12mm between each top bar. I want to relate a question to you that your type of bee hive will it be suitable to our State (Shillong, Meghalaya,India, Shillong-793003). Our Meghalaya state is a subtropical climate zone. Podinsmen – I think it might be a good hive for you. There are many top bar hives in Africa along the same climate zone as yours. You could definitely give the Warre hive a try and see how it works for you! deutschin – As many as 6 or 7 hive boxes if you have a large enough hive. Usually, the average Warre hive size is around 4-5 hive boxes. Warre’s Beekeeping for All book talks about painting a strip of wax as a starter on the top bar so the bees have it to make the comb. Have you found this to be unnecessary? Or did I miss something? Obviously it would be so much easier to skip this step. Deborah – I have found this to be an unnecessary step. Other Warre beekeepers like to lay a strip of starter wax, and some have reported that the bees like to use it. Others have reported that their bees chewed the wax down to the bare wood and started their own wax. I think that you can skip this step if you want to. Although the wax is likely unneeded, I have found that sawing a kerf into the bottom of the top bar stright through the middle seems to help and couldn’t hurt. It is very easy to do with a table saw. Logan – Right, I don’t use wax myself. My bees do just fine without waxed top bars. I don’t see what benefit a kerf on the underside of the top bar would be. You might try roughing up the bottom of the top bars to add some extra traction and surface area for the bees to attach their honeycomb to. Great instructions! Thanks sooo much! Per Brenden’s hive you sent me the links to, I’m doing mine out of plywood! I think you meant to write “Take the 8 top bars …” correct? Tom – Hoho, how did I miss that one? Yes, it should be ““Take the 8 top bars … and ….” Thanks for your sharp eyes. And thanks for your kind comments too! I have built observation windows into my Warre’s. This helps me look at how the bees are doing without lifting the lid. Just be sure to build a shutter for them. The bees don’t like so much light inside the hive and the glass doesn’t perform thermally the same way wood does. I just put wood on the outside of the glass, covering the window by about 2 cm in all directions. I just made a tonge and groove slider that slides out and back in (using a method similar to what you would do for the reveal for the top bars in the box.). I only put a window on one side, and a two-window box would be overkill. Plexiglass works okay, but I don’t like plastic in the hives (worried about outgassing), so I use glass. Logan – Sounds good! I would love to see some pictures some time of your hives. I don’t use windows that much, (not natural…do trees have windows? :)) but they are very good for learning about your bees. Nothing like watching bees live inside their own hive. chad – You may have the everything right. The Warre Hive is pretty small compared to the Langstroth. 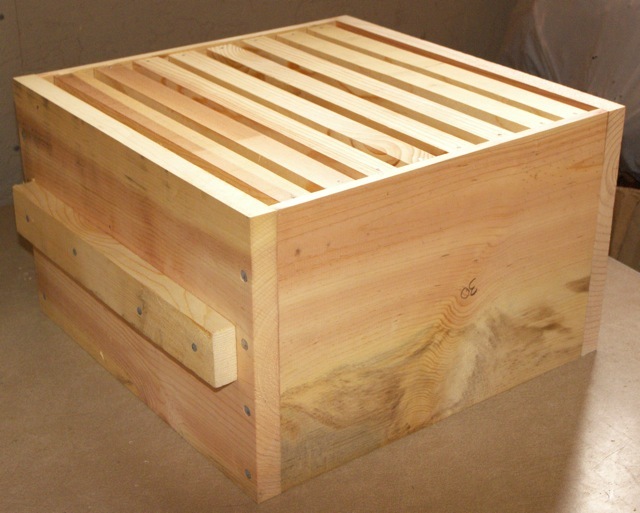 Here is what you can do: stand up a hive box as if it was assembled. Then take your interior measurements. You should have a width and length of 30 cm or 11 13/16″ If you get this measurement, your hive is the right size. Awesome instructions. But how did you make the crossbars? You said you used 1″ x 12″ callout (really 3/4″ x 11.25″ or 19mm x 286mm) shelving boards to build the hive, but I can’t see how to easily get 10mm x 24mm cross-section top bars out of that. In nature, bees build down, very seldom does a hollow tree suddenly form a new cavity above the present nest. But by adding the new box at the bottom, the bees make new comb, new brood, and the emptied upper comb becomes honey stores. Great info. I just attended a bee-keeping class and found out that you should not use plywood when building a bee hive. Apparently, bees can smell any glue that is used and it can keep them from using the hive. Don’t use any glue in building the hive box or any wood that has been glued together. I think the type of wood to use depends on where you live. Here the choice is Spruce or Pine. I haven’t been able to figure out which is preferable. Don’t think it matters as long as the bottom brood box is not sitting in water and you have done something to protect it like painted it. Thickness should be at least 3/4″ for strength and the rabbet for the frame rest. I have used plywood boxes that are nailed and glued together for both brood and supers without any problems. Bees just slather propolis all over it and go about their business. The glued joints are much stronger and the boxes hold up longer. I glue all my boxes. I know the link is for a langstroth hive, but the rabbet is the same. Sounds like any wood glue would work but is there a particular type or brand of wood glue that you have found to work better? I’m really going to try and build a couple of these. So thanks for all the info. One more item, I found a reference to how to treat the exterior. The suggestion was to take linseed oil and warm it in a pan (not boiling). Then add some beeswax to the oil. Let it cool some and then paint this all over the outside of the box and screws. Does this sound reasonable? Hi. Great site! I’m building my first Warre and I’m wondering how critical is the 8-1/4″ depth? Standard size from the lumber yard is 9-1/4″ — should I bother ripping it down? Use the dimensions required for the hive boxes. Give them too much space and they’ll fill it up with burr comb, even down to the next boxes top bars. I have been using Warres for a few yrs now and they fill up until they get the 3/8 room to move around. Hi Nick, thank you very much for the information. It took days for me to find wax supplier for the frame foundation in my country, so now I think I don’t have to look for it anymore. Why do you screw down the top bars?? Don’t you want to be able to remove them? I am just learning about this and have not built or used a hive yet. Trying to figure out which one to use. alternate running perpendicular to the one above and below in each stacked hive body? I saw on a YouTube that one gentleman was hanging the bars in alternate directions in each successive hive body. Is there a reason for this? Hi Barbara, yes, the bars run the same way in all the hive bodies. I honestly don’t see the benefit of running them back and forth like you mentioned. Seems to me it would be more confusing for the bees. If you look at hives in a natural environment then you’ll see all the comb running in the same direction. Thanks Nick. REALLY great site here. I can’t tell you how much I have used the information provided. Not any other Top Bar fans that I know of in my area here in urban Philly. NICK, is the 24 mm wideness for the top bars negotiable? I have some bars that measure slightly over at a tad under 26mm. Will using slightly wider top bars have an opposing impact on the bees? Hi Giovanni. I don’t think you’ll have a problem with those dimensions. Thanks so much Nick for this great site. I have just finished to Warre hives and will be installing my bees here in the next couple of days when they come in. How did you make the top bars?? Hi Aaron, I usually cut and plane down scrap left over from the build. Has anyone else found a better method? NIck, great site lots of info. I have some mahogony from an old sailboat,beautiful wood but has a shelac finish. I will sand the inside but do I need to sand the outside also and if so why. If the wood needs to breath isn’t that what the quilt box is for? Doesn’t painting create the same problem. Lowes & Home Depot have some small trim boards about an inch wide and around 2/4 of an inch thick. That is what I used for my old style top bars. I just cut a groove in the bottom and shoved in a piece of string I dipped in beeswax. They used them right away. Can I skip making a rebate in the sides (due to lack of equipment) by putting on a rail on each side for the frames to rest on? Or will that create too much space which will then have other complications? Hi Hermann, if you hang a rail then the bees will build comb under it and you’ll never get the bars off. If that’s not a concern then it will work fine. 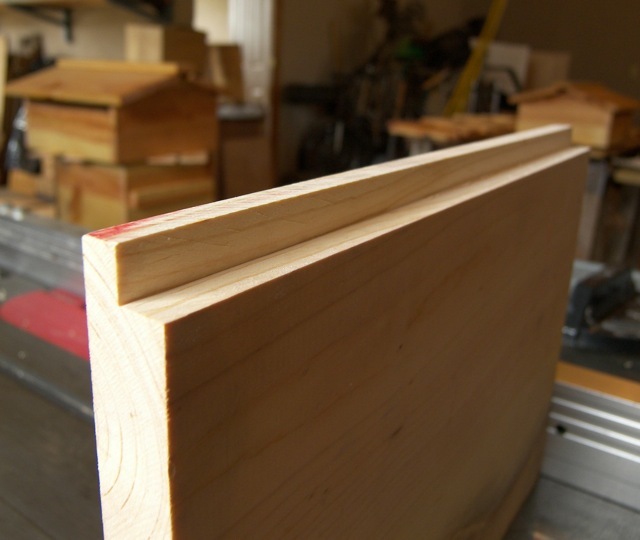 You could use a piece of 1/2″ plywood that is the same dimension as the hive wall only cut 3/8″ shorter. Nail and glue this new piece onto the hive wall 3/8″ down from the top and you will be left with the rebate. hey nick, i have some spare wood here that i was gonna use for my top bars but it is a little less than 15/16″ wide…would that be an issue??? Nick, Thanks…the top bars are 3/4…so i am good to go…here comes part 2…i live in south mississippi and are prone to hurricanes and thunderstorms which produce high gusts of wind…any ideas for a system to “secure” the hive from being blown over??? Hi Nick thanks for the great info. I am assembling my hive boxes right now and I am anything but a competent carpenter so my boxes are not sitting exactly flush, the back left corner between 2 of the hive bodies has about a 1-3mm separation between them will this be a problem or will the bees just use porpolis to seal them together? Hi Colin, glad to hear the plans helped. I small gap like that can be really hard to get rid of. Thankfully the bees aren’t too critical about our woodworking skills 🙂 they should fill the gap with propolis no problem. Oh and keep in mind that If you plan on getting into your hives often then the extra propolis will make it harder to pry that box loose. -Did you place any comb guides on the top bars? -If I’ve understood correctly, the bees aren’t able to get in and out of the hive from the top… is that right? I know it isn’t relative to the bee box, but the roof is designed without any entrances…. right? Thanks a lot again for your answers. It’s really appreciated! FASTENING THE BARS: I don’t have a specific source for this, but as I’ve been doing my research I’ve seen *many* comments that US law (in at least some states if not all) requires bars to be removable for inspection by agricultural authorities. Might’ve also seen that that’s a requirement in some Euro countries too. I put little spacer blocks into the rabbet so the top bars fit in snugly but are easy enough to remove. One other option would be to use thin finish brads, and drill just slightly larger holes through the top bars for them. The brads act as ‘pins’ to locate and space the bars properly and keep them from moving. This is an amazing step by step guide that I’ll be using to construct my own hives. I can’t wait to get started! I don’t see why not. I would be sure to seal the cut edges to prevent the plywood from delaminating. Other than that you should be good to go.